The North of England will gain an iconic link in its transport network in Autumn 2017 with the opening of the Mersey Gateway. The Gateway is a new road link in the Borough of Halton, connecting Widnes and Runcorn, and providing a much improved link to the M56 motorway. It involves 9km of new and improved highways, the centrepiece of which is a new six-lane bridge over the River Mersey. 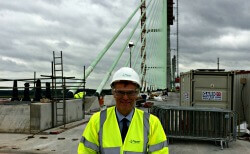 Courtesy of the Mersey Gateway Crossings Board and Merseylink, Transport for the North’s Jonathan Brown visited the site in July 2017. The first impression of the new gateway is its scale. The three towers that will support the new cable-stayed bridge are visible from miles around and are a new landmark in the area. The towers vary in height between 125 metres and 80 metres, giving the bridge a unique appearance. This is due to restrictions on where the towers could be sited and also the need for the highest section of the bridge to span the Manchester Ship Canal, an important commercial waterway, which is crossed by the bridge’s southern approach viaduct. The extensive approach viaducts mean that the bridge is over 2.1 kilometres long, with a span over the River Mersey of 1,000 metres. At the time of our visit, construction work on the new bridge was nearing completion, with one small gap in the bridge deck remaining, this being filled a few days after our visit. The site was a hive of activity with the completion date fast approaching. Up to 1,000 people are working on the site at any one time. 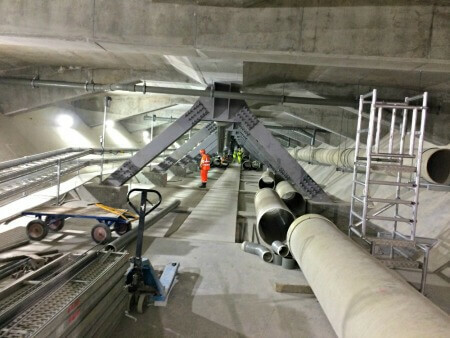 An innovative feature of the construction is a temporary trestle bridge built underneath the main bridge, which allows plant vehicles and workers to cross the estuary. This temporary structure will be removed when the main bridge is opened. The Mersey Gateway will provide relief to the existing Silver Jubilee Bridge, which links Runcorn and Widnes, and is the only crossing of the River Mersey between the Mersey Tunnels and Warrington Town Centre. The Silver Jubilee Bridge dates from 1961 and was reconfigured to four lanes in 1977, hence its name marking 25 years of the Queen’s reign. The Silver Jubilee Bridge now carries over 80,000 vehicles per day, ten times its original design capacity, and is a frequent source of delay. When the Mersey Gateway opens, the Silver Jubilee Bridge will be closed for up to a year to allow for repairs. A new crossing between Widnes and Runcorn has long been an aspiration of Halton Borough Council, with studies going back to the 1970s. The project was finally given the go-ahead in 2011. The total cost of the Mersey Gateway is £1.86 billion, funded by a public private partnership and by grants from the Department for Transport. The bridge will be tolled, with the income generated providing a significant proportion of the construction cost. The initial toll cost for a car will be £2 and between £6 and £8 for buses and goods vehicles. These costs will be reduced for users who register. In addition, for eligible residents of the Borough of Halton, no tolls will apply other than an annual £10 administration fee. All tolls will be collected automatically using an Automatic Number Plate Recognition System. Drivers will not need to carry cash and there won’t be any tollbooths or tag system, which other tolled crossings have. When it reopens, the Silver Jubilee Bridge will also be tolled and toll charges for both the new Mersey Gateway and reopened bridge will be in line with those of the Mersey Tunnels. As well as relieving the existing congested Silver Jubilee Bridge, the Mersey Gateway will have significant economic benefits for Halton and the wider area. It will be a transformational project. It is the catalyst that will connect communities and lead regeneration and investment throughout Halton and the North West. It is forecast to lead to 4,640 permanent new jobs, resulting in £61.9 million a year in Gross Value Added. The local economy has also already benefited significantly from the Mersey Gateway, with Merseylink awarding £129m worth of contracts to North West businesses in the first year of construction. A unique feature of the Mersey Gateway project is the Mersey Gateway Environmental Trust, an independent charitable trust, which is promoting the conservation, protection and improvement of the environment across a 1600 hectare area of the upper Mersey estuary, running all the way from the Mersey Gateway Bridge up river as far as Warrington. The Trust aims to create a new 28.5 hectare nature reserve around the bridge. The Mersey Gateway is being promoted by Halton Borough Council, a unitary authority which is now part of the Liverpool City Region. Halton Borough Council has established the Mersey Gateway Crossings Board to act as client for the scheme on its behalf. 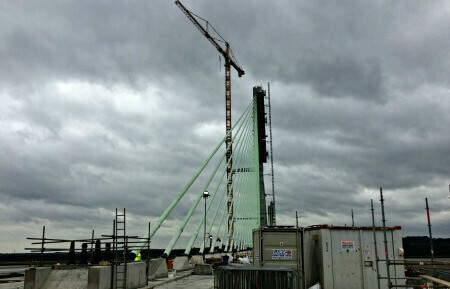 The Mersey Gateway is being constructed by Merseylink, a consortium of Macquarie Capital (Australia), FCC Construcción S.A. (Spain) and BBGI as sponsors and the contractors are FCC Construcción, Kier Infrastructure and Overseas Ltd and Samsung Construction &Trading (C&T) of South Korea. The tolling system will be operated by French company emovis, which operates the Dartford Crossing tolling scheme and others internationally. The expertise of the delivery partners has allowed significant savings in the construction cost of the Mersey Gateway to be realised.